Researchers used the rectangular coils shown here to strike the magnetic fields that enclose the donut-shaped plasma. The colors of the plasma denote the different vibrations produced by striking the fields with external magnetic coils. Credit: Princeton Plasma Physics Laboratory and General Atomics. 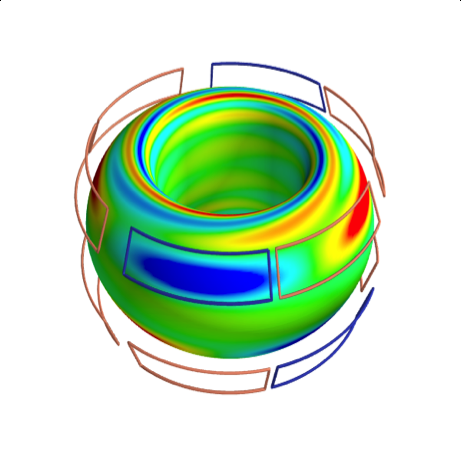 The swirling plasma in donut-shaped fusion facilities called tokamaks are subject to intense heat bursts that can damage the vessel's walls. Halting or mitigating these bursts, called Edge Localized Modes (ELMs), is a key goal of fusion research. While physicists have long known that they could suppress ELMs by pushing and pulling on the plasma with magnetic fields, they frequently found that doing so destabilized the core of the plasma. The reason for this was that perturbing the plasma as they were doing always led to the same response, like producing the same note when striking a tuning fork. Now scientists at General Atomics and the U.S. Department of Energy's Princeton Plasma Physics Laboratory (PPPL) have found an effective way to mitigate ELMs without adversely affecting plasma in the core region. They were able to do this because the magnetic fields that enclose the plasma are like the strings on a violin that produce notes when struck with the fields from external magnetic coils (Figure 1). And one of these notes, the researchers found, is particularly useful for preventing ELMs. They discovered this note by pushing and pulling the fields that encircle the tokamak for two rotations instead of the standard one during experiments on the DIII-D National Fusion Facility that General Atomics operates for the DOE in San Diego. This produced a very stable mode of response that can be used to help control the edge of the plasma. The researchers verified these findings with diagnostics that showed the different plasma responses to the two-rotation perturbations. "We now understand how to pluck just the notes that sound the best, giving us the power to fine-tune our plasmas" says Nikolas Logan, who led the research team with Carlos Paz-Soldan of General Atomics and will give an invited talk on the results at the 57th Annual Meeting of the APS Division of Plasma Physics. These finding could have important implications for ITER, the multinational tokamak being built in France. They suggest that ITER may be able to use the newly discovered results to prevent or mitigate ELMs without impacting overall performance.